Day 293: Take A Road Trip This Summer . . .
Just noticed that gas prices have gone up AGAIN. . .so much for any help from our government. With leaders like the bunch in Washington, we can expect to no longer have driving family vacations. . . no, we’ll have to ride bicycles–especially with all of those new, nifty bike lanes for the five riders using them! Summer used to mean hitting the open road for a driving vacation. We remember the summer after we got married—a huge driving trip from Houston to St. Louis to Chicago to Denver to Midland and back to Houston. Two years later it was a trip to the East Coast–New York, Niagara Falls, Windsor, Ontario, Chicago. . .this trip was about 4,200 miles–in 10 days! Man, there was nothing better than hitting the open road. . .one time we decided to surprise Brian’s nephew on the occasion of his First Communion by driving to Denver–for the weekend. We lived in St. Charles at the time and figured that we could drive through the night–arrive at daybreak–take a quick snooze–enjoy the family and then get back in the car and reverse the process. We did just that—left after work on Friday…arrived on Saturday morning…took a little snooze…stayed through the ceremony at Mass on Sunday and hit the road getting home around 2 am on Monday and back to work! OH, the things we can do when we’re young! Tonight, we thought about road trips and opened a nice bottle of sangiovese from Italy called Rapido Red . 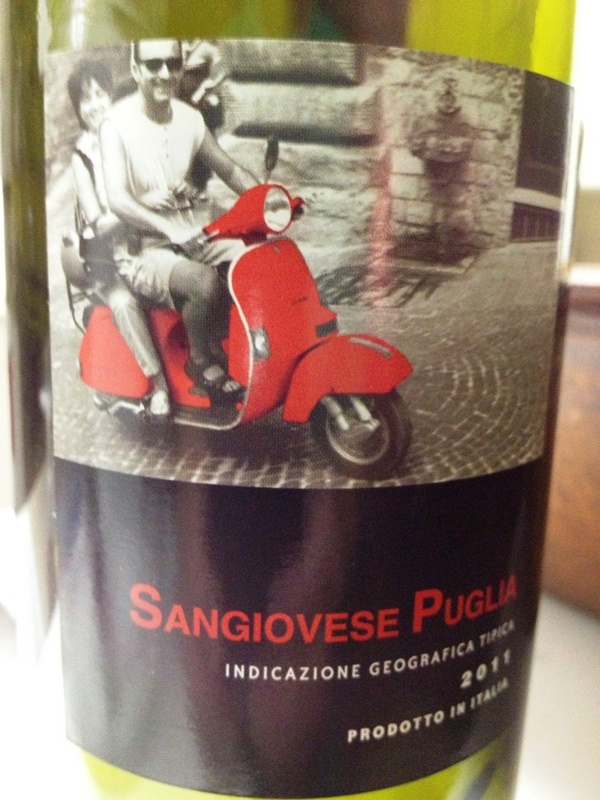 . . our 2011 Sangiovese Pugila was definitely a young wine. It had a pleasant nose with lots of fruit options that came through loud and clear while sniffing. The taste was tart and it lingered . . . not sure if that was a good thing or bad thing. It wasn’t what we would have expected from a dark purple colored wine and full-bodied nose. The youth of the wine came through loud and clear and it wasn’t necessarily pleasing to the ear or the palate. For less than $13 a bottle, we expected more but probably should have tempered our expectations if only because Italian wines as a rule need some time to mature in the bottle. And today’s wine was definitely short on maturity. We’re hitting the road–but not in a car–for a trip to the great northeast. We’re hoping that the weather cooperates up there –we’ve earned it! All things considered, taking a trip in the beginning of summer is a great way to enjoy some-not-so-hot weather. A short note tonight as we prepare to hit the road; remember to enjoy your favorite wine responsibly and recycle whenever possible. Categories: Uncategorized | Tags: road trips, Sangiovese Pugila | Permalink.